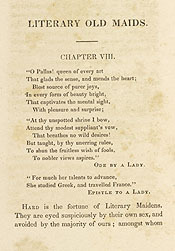 First published in London in 1835, this satirical look at unmarried women demonstrates that women who did not choose the conventional paths of marriage and children were fair targets for ridicule. Old Maids, Their Varieties, Characters, and Conditions. New York: C. Shepard, 1835.